On Saturday, America’s Jewish president received a red-carpet treatment on his arrival in Riyadh on a 2-day visit before flying to the Zionist entity to meet his handler Benjamin Netanyahu. 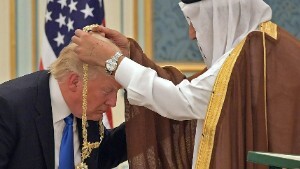 Even though, Trump was able to rob Saudi ‘royals’ on US$110 billion in arms sale and US$200 billion investment in American infrastructure – his longtime Jewish ally, Roger Jason Stone, was not happy Trump meeting with Saudi ‘royals’ – because he didn’t like his six foot-two tall buddy lean in front of much shorter Saudi King Salman so the latter could place the huge royal gold medal around Judas’ goat’s neck (BTW: President Barack Obama performed a similar gymnastic act in front of Saudi King in 2012 to receive a gold medal which was condemned by the anti-Islam lobby including Trump). “Saudi Arabia is an enemy. Accepting the award makes me want to puke,” tweeted Roger Stone. Donald Trump has eight companies operating in Saudi Arabia. Saudi ‘royals’ gave US$16 billion aid to the Zionist entity in 2013-14. Former Trump campaign adviser and a very close friend, Roger Stone (On August 9, 2015 the Jewish Daily Forward reported him being Jewish but later JTA retracted it saying Roger Stone is a Catholic) doesn’t believe in the official 9/11 story. Furthermore, he had praised the research of false flag whistleblower and author of several books, professor James Fetzer who has debunked official stories of 9/11, Sandy Hook, Boston Marathon bombing, San Bernardino shooting and Paris shooting. Roger Stone is also accused of believing that Democratic party Jew staffer Seth Rich, 27, was murdered over leaking 40,000 Hillary Clinton’s e-mails to Wikileaks, which serves Israel-Pentagon interests. Roger Stone campaigned for Broward County Sheriff Scott Israel (Jew) in 2012. On July 31, 2015 David Horowitz’s FrontPage magazine accused Scott Israel of having ties with Gaza-ruling Hamas supporters. On Saturday, Roger Stone said that US Senate committee investigating Donald Trumps’ links with Putin, has asked him to testify. Stone said neither he nor Trump have anything to fear in a fair, balanced inquiry. Carter Page (Jew), Trump’s former campaign adviser is also being investigated for passing-on secrets to Russian intelligence. Page, a banker, worked in Moscow for three years. He had met Russian Ambassador to the US Sergey Kislyak in Washington several times. Last year, Israeli propaganda channel CNN banned Roger Stone for some secret reasons. Saudi ‘royals’ threw a Salman-Trump Islamic summit aka US-Arab Islamic summit in honor of Donald Trump. The summit is attended by leaders of the Muslim NATO many of which are not even Arabs such as world’s most populated Muslim states on Indonesia and Pakistan. Lebanon’s Arab-Christian president refused to attend the summit. Riyadh withdrew its invitation to the Sudanses president under pressure from Trump team. As expected Iranian and Syrian presidents were not even invited to attend the summit. The title ‘Muslim Nato” title was coined by a Jew idiot Jon Boone at Rupert Murdoch’s British daily The Guardian on January 8, 2017. Now if I dare to take the credit for that ‘invention’ – you would certainly call me an antisemite. The Muslim NATO is headed by Pakistan’s retired Gen. Raheel Nawaz (no relation to Pakistan’s millionaire prime minister Nawaz Sharif. In November 2015, the General made a historic visit to Washington which made Israeli and Indian Top Guns very very jealous.